"My basketball teammates were my first babysitters." Wil Smith was 27 when he enrolled as a freshman at Bowdoin College in Maine in 1996. But his age wasn’t the only thing that set him apart from his classmates, Wil arrived with his infant daughter, Olivia, in tow. As a teenager, Olivia sat down with her dad to look back on their college days. Wil and Olivia recorded this conversation shortly after he was diagnosed with colon cancer. Originally broadcast June 15, 2012, on NPR’s Morning Edition. Note: StoryCorps remembers Wil Smith, who recorded a conversation with his daughter, Olivia, about being a single dad in college. At the time of this interview in 2012, Wil had just been diagnosed with colon cancer. He died on February 22, 2015, at the age of 46. OS: Were you ever embarrassed bringing me to class? Or just having me in general? WS: I felt a little awkward, but never embarrassed. There were times when the only way I could get through was to come in and look at you, and see you sleeping, and then go back to my studies. 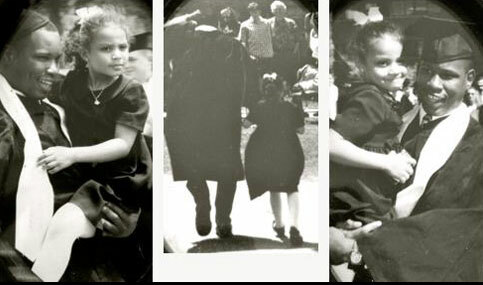 And my graduation day from Bowdoin is a day I’ll never forget. You know, all of my classmates, they stood up and gave me the only standing ovation. WS: Yeah, the dean called both of our names as he presented us with the diploma. OS: So, technically I already graduated from college. WS: Nice try. [laughs] The degree only has my name on it. So you still got to go. OS: I really admire your strength. And, I love you. WS: I draw my strength from you. I always have and I still do.